SALISBURY, MD. (March 3, 2015) – On a cold winter’s day with their fields blanketed in snow, farmers Dave and Linda Burrier don’t get a day off. There’s paperwork to do – lots of it. Maryland farms like Burrier Farms, located in Union Bridge, have to file a nutrient management plan with the state every year. The Burriers, who grow soybeans, hay, corn and wheat on more than 1,200 acres, also raise cattle. Stewardship of the land isn’t just a legal requirement for these farmers, though. It’s a personal and professional ethic many Maryland farmers share. So much so, in fact, that Maryland farmers participating in the state’s 2014-2015 Cover Crop Program planted a record 478,000 acres of cover crops on their fields last fall to control soil erosion, reduce nutrient runoff and protect water quality in streams, rivers, and the Chesapeake Bay. The 2014 cover crop planting is the largest in Maryland history, exceeding the previous record of 430,000 acres in 2012. Maryland farmers exceeded the Phase I and II Watershed Implementation Plan milestone for cover crops in 2011 and 2013 and with this planting, have exceeded the milestone commitment for 2015. Cover crops are widely considered to be one of the most environmentally sustainable ways to protect water quality in the Chesapeake Bay and its tributaries. Collectively, the 478,000 acres of cover crops planted will prevent an estimated 2.9 million pounds of nitrogen, and 95,600 pounds of phosphorus from impacting waterways. The Burrier farm has been in the family since 1962, and each year the Burriers strive to improve the soil quality, protect waterways and maintain strict conservation practices. “Caring for the land we farm is important to our family. Conservation is the right thing to do, but it also rewards us with high-quality crops. We also use no-till farming, strip cropping, crop rotations and cover crops,” says Dave. No-till farming is a practice that grows crops without using tilling, also known as plowing, which can be a major factor in soil erosion. Strip cropping also prevents soil erosion by creating natural dams for water, helping to preserve the strength of the soil. Cover crops such as cold-hardy wheat, rye and barley, are planted in the fall. Once established, the cover crops recycle unused plant nutrients that may remain in the soil from the previous summer crop. They also protect fields against wind and water erosion and improve soil health, increasing organic matter in the soil, reducing weeds and pests, and providing a habitat for beneficial insects. The Burriers also rotate the crops they plant in a certain field each year. Off the farm, Dave and Linda have made it a priority to serve on agricultural boards and committees, including the Maryland Soybean Board. In October, Linda was appointed to the United Soybean Board. About Maryland Soybean Board: The Maryland Soybean Board administers soybean checkoff funds for soybean research, marketing and education programs in the state. One-half of the checkoff funds stay in Maryland for programs; the other half is sent to the United Soybean Board. 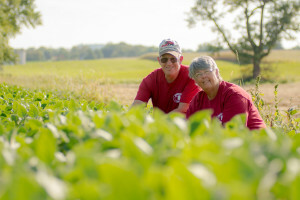 To learn more about the Maryland Soybean Board, visit www.www.mdsoy.com.